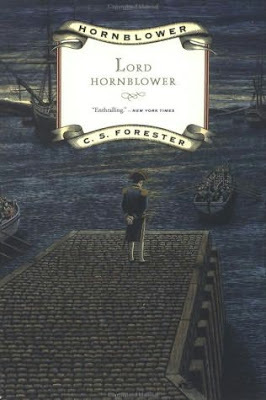 Lord Hornblower (1946) is C. S. Forester’s tenth Hornblower novel by chronology, fifth by publication. Commodore Horatio Hornblower is sent to the coast of France to deal with a ship of British mutineers who have threatened to take refuge in France. Not content just to handle this problem, Hornblower also gets himself involved in a French occupation and guerilla warfare. The earliest part of Lord Hornblower, where Hornblower is dealing with the mutinous Flame, is the novel’s best. It features an unpredictable and creative resolution that hearkens to many of Hornblower’s pre-captaincy adventures. When the book moves into France, however, it suffers. Land campaigns are still not Forester’s strong suit, and he skips over lengthy time periods where quite a lot happens in order to fit this story into one novel. One of Commodore Hornblower’s main problems was that Hornblower was well-removed from the action, and never in any real danger. Forester has corrected this here, perhaps to the extreme. Hornblower, as usual, is wildly successful in his endeavors, although he benefits greatly from several very convenient plot devices and not a little bit of deus ex machina. And as severe and hard on himself as Hornblower is in most areas of his life, and as guilty as he feels when he perceives a failing in himself, it continues to be remarkable that he always drops his pants the first chance he gets, with no regard for anyone but himself. At least he never really has the decency to feel bad about it afterward. It has become quite clear that the novels of Hornblower’s earlier career are superior – both the stories and the man himself are considerably more interesting and likable.